Kazakhstani (Kazakhstani includes all citizens, in contrast to Kazakh, which is the demonym for ethnic Kazakhs). Historians believe the vast steppes of Kazakhstan were where humans first domesticated the horse. Indeed, its name is derived from an ancient Turkic word meaning "independent, a free spirit," reflecting the Kazakh people’s nomadic horseback culture. Human activity has badly damaged the environment. The gravest threat comes from radiation, a result of the Soviet Union testing almost 500 nuclear weapons, above ground and often without notifying residents. 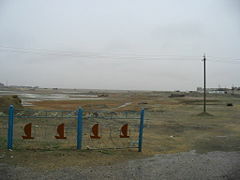 Agricultural practices have shrunk the Caspian Sea, caused extensive wind erosion, and rendered farmland sterile. Aging factories pump contaminated waste into the water supply. Untapped oil wealth and their abundance of natural resources offers a huge potential benefit for the nation. However, the burden of their past environmental abuses must be dealt with. The word “Kazakh” is derived from an ancient Turkic word meaning "independent, a free spirit." It reflects the Kazakh people’s nomadic horseback culture and is related to the term "cossack." The old Persian word "stan" means "land" or "place of." Kazakhstan has borders with Russia, the People's Republic of China, and the Central Asian countries Kyrgyzstan, Uzbekistan and Turkmenistan, and has a coastline on the Caspian Sea. With an area of 1.05 million square miles (2.7 million square kilometres), Kazakhstan is the ninth largest country in the world by area, and is the largest landlocked country in the world. It is equivalent to the size of Western Europe. Top of the Belukha, Altay Mountains. The steppes of Eastern Kazakhstan in Altyn Emeil National Park, where Genghis Khan reportedly once rode, appear to stretch out forever. 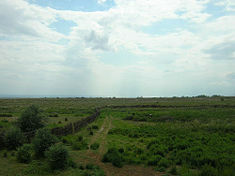 Syrdarya river in Kyzylorda province. The terrain extends west to east from the Caspian Sea to the Altay Mountains and north to south from the Western Siberia plains to the oases and deserts of Central Asia. The Kazakh Steppe, with an area of around 310,600 square miles (804,500 square kilometres) occupies one-third of the country, and is the world's largest dry steppe characterized by large grassland and sandy regions. There is considerable topographical variation within Kazakhstan. 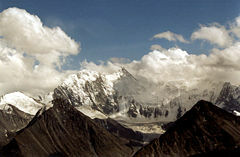 The highest elevation, Khan Tengri Mountain, on the Kyrgyz border in the Tian Shan range, is 23,000 feet (7010 meters). The lowest point, at Karagiye, in the Caspian Depression in the west, is 430 feet (132 meters) below sea level. Only 12.4 percent of Kazakhstan is mountainous, mostly in the Altay and Tian Shan ranges of the east and northeast, although the Ural Mountains extend south from Russia. Many Altay and Tian Shan peaks are snow covered year-round, and their run-off is the source for Kazakhstan's rivers and streams. 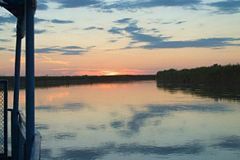 Important rivers and lakes include: the Aral Sea, Ili River, Irtysh River, Ishim River, Ural River, Lake Balkhash, and Lake Zaysan. Astana, formerly named Akmola, and Tselinograd, with an estimated population of 600,000 in 2004, is the third largest city and has been the capital of Kazakhstan since 1997. Other cities include Almaty (the former capital), Karaganda, Shymkent (Chimkent), Semey (Semipalatinsk) and Turkestan. Because Kazakhstan is so far from the oceans, the climate is continental and dry. 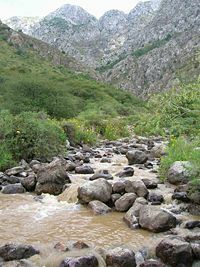 Precipitation in the eastern mountains averages as much as 24 inches (600 millimeters) per year, mostly as snow, but most of the republic receives only four to eight inches (100 to 200 millimeters) yearly. Kazakhstan is sunny. Average winter temperatures are 26.6°F (-3°C) in the north and 64.4°F (18°C) in the south. Summer temperatures average 66°F (19°C) in the north and 86°F (30°C) in the south. Within locations differences are extreme, and temperature can change suddenly. The winter air temperature can fall to -58°F (-50°C), and in summer the air temperature can reach as high as 122°F (50°C). Fauna that can be found in the steppes includes the Saiga Antelope, Siberian Roe Deer, wolves, foxes, badgers, snow leopards, eagles, and falcons. Kazakhstan has an abundant supply of accessible mineral and fossil fuel resources. Development of petroleum, natural gas, and mineral extraction has attracted most of the over $40-billion in foreign investment in Kazakhstan since 1993 and accounts for some 57 percent of the nation's industrial output. Kazakhstan has the second largest uranium, chromium, lead, and zinc reserves, the third largest manganese reserves, the fifth largest copper reserves, and ranks in the top ten for coal, potassium, iron, and gold. Diamonds are exported. Oil explorations have shown that the deposits on the Caspian shore are only a fraction of a larger deposit. Possibly, 3.5 billion tons of oil and 2.5 trillion cubic meters of natural gas could be found there. The total estimated oil deposits is 6.1 billion tons. There are only three refineries within the country, situated in Atirau, Pavlodar, and Shymkent, and none are capable of processing crude, which is exported to Russia. Natural hazards include earthquakes in the south, and mud slides around Almaty. Human activity has badly damaged the environment. Most water is polluted by industrial effluents, pesticide and fertilizer residue, and, in some places, radioactivity. The most visible damage has been to the Aral Sea, which in the 1970s was larger than most of the Great Lakes of North America. Sharply increased irrigation caused the sea to shrink. By 1993, the Aral Sea had lost an estimated 60 percent of its volume, and was breaking into three unconnected segments. Increasing salinity and reduced habitat killed the fish, destroying its fishing industry, and the receding shoreline has left the former port of Aral'sk more than 38 miles (60km) from the water's edge. The depletion of this large body of water has increased temperature variations in the region, which has harmed agriculture. A much greater harm to agriculture has come from the salt- and pesticide-laden soil that the wind is known to carry to the Himalaya Mountains and the Pacific Ocean. Deposits of this saline soil on fields sterilizes them. Infant mortality in the region approaches 10 percent compared with the 1991 national rate of 2.7 percent. Meanwhile, the water level of the Caspian Sea has been rising steadily since 1978 for reasons that scientists have not been able to explain fully. At the northern end of the sea, more than 10,000 square kilometers of land in Atyrau Province have been flooded. Wind erosion has also had an impact in the northern and central parts of the republic because of the introduction of wide-scale dryland wheat farming in the 1950s and 1960s. By the mid-1990s, an estimated 60 percent of the republic's pastureland was in various stages of desertification. Industrial pollution is a greater concern in Kazakstan's manufacturing cities, where aging factories pump huge quantities of unfiltered pollutants into the air and groundwater. The former capital and largest city, Almaty, is particularly threatened, in part because of the post–independence boom in private automobile ownership. The gravest environmental threat to Kazakhstan comes from radiation, especially in the Semey (Semipalatinsk) region of the northeast, where the Soviet Union tested almost 500 nuclear weapons, 116 of them above ground. Often, such tests were conducted without evacuating or even alerting the local population. Although nuclear testing was halted in 1990, radiation poisoning, birth defects, severe anemia, and leukemia are very common in the area. The government has established a Ministry of Ecology and Bioresources, with a separate administration for radio–ecology, but the ministry's programs are under-funded and given low priority. Gokturk khaganates at their height, c. 600 C.E. : ██ Western Gokturk: Lighter area is direct rule, darker areas show sphere of influence. ██ Eastern Gokturk: Lighter area is direct rule, darker areas show sphere of influence. Kazakhstan has been inhabited since the Stone Age, generally by nomads practicing pastoralism, for which the region's climate and terrain are best suited. Prehistoric Bronze Age cultures that extended onto Kazakh territory include the Srubna culture (sixteenth-ninth centuries B.C.E. 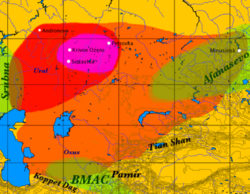 ), the Afanasevo culture (3500—2500 B.C.E.) and the Andronovo culture (ca. 2300–1000 B.C.E.). Historians believe the vast steppes of Kazakhstan were where humans first domesticated the horse. Following the Mongolian invasion in the early thirteenth century C.E., administrative districts were established under the Mongol Empire, which eventually became the territories of the Kazakh Khanate. The major medieval cities of Taraz and Hazrat-e Turkestan were founded along the northern route of the Silk Road during this period. The earliest documented state in the region was the Turkic Kaganate, or Gokturk state, established by the Ashina clan, in the sixth century C.E. The Qarluqs, a confederation of Turkic tribes, established a state in what is now eastern Kazakhstan in 766. In the eighth and ninth centuries, Arabs conquered portions of southern Kazakhstan and introduced Islam. The Oghuz Turks controlled western Kazakhstan from the ninth through the eleventh centuries; the Kimak and Kipchak peoples, also of Turkic origin, controlled the east at roughly the same time. The large central desert of Kazakhstan is still called Dashti-Kipchak, or the Kipchak Steppe. In the late ninth century, invaders destroyed the Qarluq state and established the large Qarakhanid state, which occupied Transoxiana, the area north and east of the Oxus River (the present-day Amu Darya), extending into what is now China. Beginning in the early eleventh century, the Qarakhanids fought among themselves and with the Seljuk Turks to the south. In the course of these conflicts, parts of present-day Kazakhstan shifted back and forth between the combatants. The Qarakhanids, who accepted Islam and the authority of the Arab Abbasid caliphs of Baghdad, were conquered in the 1130s by the Karakitai, a Turkic confederation from northern China. In the mid-twelfth century, an independent state of Khorazm along the Oxus River broke away from the weakening Karakitai, but the bulk of the Karakitai state lasted until the Mongol invasion of Genghis Khan in 1219-1221. After the Mongol capture of the Karakitai state, Kazakhstan fell under the control of a succession of rulers of the Mongolian Golden Horde, the western branch of the Mongol Empire. The horde, or zhuz, is the precursor of the present-day clan. By the early fifteenth century, the ruling structure had split into several large groups known as khanates, including the Nogai Horde and the Uzbek Khanate. The Kazakhs emerged from a mixture of tribes living in the region in about the fifteenth century and by the middle of the sixteenth century had developed a common language, culture, and economy. In the early 1600s, the Kazakh Khanate separated into the Great, Middle and Little (or Small) Hordes (jüz)—confederations based on extended family networks. Political disunion, competition among the hordes, and a lack of an internal market weakened the Kazakh Khanate. The beginning of the eighteenth century marked the zenith of the Kazakh Khanate. In the nineteenth century, the Russian Empire spread into Central Asia. The "Great Game" period of rivalry and strategic conflict between the British Empire and the Tsarist Russian Empire for supremacy in Central Asia, is regarded as running from approximately 1813 to the Anglo-Russian Convention of 1907. Following the Bolshevik Revolution of 1917 a second less intensive phase followed. The tsars effectively ruled over most of the territory belonging to what is now the Republic of Kazakhstan. The Russian Empire introduced a system of administration and built military garrisons and barracks in its effort to establish a presence in Central Asia. The use of the Russian language was required in all schools and government organizations, arousing resentment among the Kazakh people. By the 1860s, most Kazakhs resisted Russia's annexation because it disrupted the traditional nomadic lifestyle and livestock-based economy. A Kazakh national movement began in the late 1800s, seeking to preserve the Kazakh language and identity. From the 1890s, increasing numbers of Slavic settlers began colonizing the area, especially once the Trans-Aral Railway from Orenburg to Tashkent was completed in 1906. The competition for land and water during the final years of tsarist Russia resulted in an uprising, the Central Asian Revolt, in 1916. A brief period of autonomy followed the collapse of the Russian Empire, but the Kazakhs eventually succumbed to Soviet rule. In 1920, the area became an autonomous republic within Russia and, in 1936, a Soviet republic. Repression of the traditional elite, plus forced collectivization in late 1920s–1930s, brought mass hunger and unrest. But the communist apparatus gradually integrated Kazakhstan into the Soviet system. Thousands exiled from other parts of the Soviet Union during the 1930s arrived, as did hundreds of thousands evacuated from the Second World War battlefields. Some were deported to Siberia or Kazakhstan because of their ethnicity or beliefs, and were interned in some of the biggest Soviet labor camps. The Kazakh Soviet Socialist Republic (SSR) contributed five divisions to the Soviet Union's World War II effort. In 1947, the Semipalatinsk Test Site, the USSR's main nuclear weapon test site was founded near the city of Semey. World War II brought increased mining and industrialization, although by the time Soviet leader Joseph Stalin died, Kazakhstan still had an agricultural economy. In 1953, Soviet leader Nikita Khrushchev initiated the ambitious "Virgin Lands" program to turn pasture into a grain-producing region for the Soviet Union. This policy, with modernizations under Soviet leader Leonid Brezhnev, hastened the development of the agricultural sector, which remained the source of livelihood for a large percentage of Kazakhstan's population. Demands for political and economic reforms within the Soviet Union came to a head in the 1980s. In December 1986, young ethnic Kazakhs in Almaty protested the replacement of the First Secretary of the Communist Party of Kazakhstan Dinmukhamed Konayev with Gennady Kolbin, an ethnic Chuvas from the Russian Federation. Dozens of demonstrators were jailed or killed. Discontent continued, resulting in Soviet president Mikhail Gorbachev's policy of glasnost (openness). Kazakhstan declared itself a republic within the Union of Soviet Socialist Republics in October 1990. Following the August 1991 abortive coup attempt in Moscow and the subsequent dissolution of the Soviet Union, Kazakhstan declared independence on December 16, 1991. The years following independence have been marked by significant reforms to the Soviet command-economy and political monopoly on power. 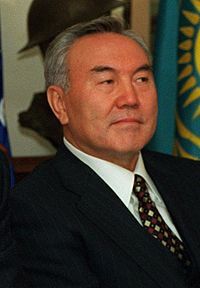 Nursultan Nazarbayev, who initially came to power in 1989 as the head of the Communist Party of Kazakhstan, was easily elected president in November, 1991. Kazakhstan has since made progress toward developing a market economy, and has enjoyed significant economic growth since 2000, partly due to its large oil, gas, and mineral reserves. The politics of Kazakhstan take place in the framework of a presidential republic, whereby the President of Kazakhstan is head of state and nominates the head of government. The nature of government is authoritarian presidential rule, with little power outside the executive branch. The president is elected by popular vote for a seven-year term, and constitutionally had a two-term limit. The president appoints a council of ministers (cabinet). The president also is the commander in chief of the armed forces and may veto legislation that has been passed by the Parliament. Nazarbayev arranged a referendum in 1995 that extended his term of office and expanded his presidential powers. Only he can initiate constitutional amendments, appoint and dismiss the government, dissolve parliament, call referenda at his discretion, and appoint administrative heads of regions and cities. The president appoints the prime minister and first deputy prime minister. The prime minister chairs the Cabinet of Ministers and serves as Kazakhstan's head of government. There are three deputy prime ministers and 16 ministers in the Cabinet. The president appoints a Council of Ministers. The bicameral parliament comprises a senate and a Mazhilis. The senate has 39 seats. The president appoints seven senators. Other members are elected from each of the 14 oblasts, the capital of Astana, and the city of Almaty, to serve six-year terms. Former presidents are ex-officio senators for life. The Mazhilis has 77 seats. Ten out of the 77 Mazhilis members are elected from the winning party's lists. Other members are popularly elected to serve five-year terms. Most legislation considered by the Mazhilis is proposed by the government. All aged 18 years of age and over may vote. The judiciary comprises a Supreme Court of 44 members and a Constitutional Council of seven members. Local and national courts resemble those in the Western world, but lack of checks and controls. A variety of different police units, a remnant of the Soviet era, leads to problems of jurisdiction. In urban areas, robberies and theft are common. Murder, suicide, and other violent crimes are increasing. The drug trade from Afghanistan has given rise to organized crime. Embezzlement, tax fraud, and abuse of power and privilege are tacitly accepted. Kazakhstan is divided into 14 provinces (oblys) and three municipal districts (qala). Each is headed by an akim (provincial governor) appointed by the president. Municipal akims are appointed by oblast akims. The Government of Kazakhstan transferred its capital from Almaty to Astana on December 10, 1997. In 1995, Russia leased for 20 years an area of 2300 square miles (6000 square kilometers) enclosing the Baikonur Cosmodrome space launch center and the city of Bayqongyr (formerly Leninsk). The lease was later extended through 2050. On June 18, 2006, Kazakhstan became a space-faring nation when it launched its first commercial satellite, KazSat 1, from the Baikonur Cosmodrome on a Russian-built booster rocket. Kazakhstan has stable relationships with all of its neighbors and is a member of the United Nations, Organization for Security and Cooperation in Europe, Euro-Atlantic Partnership Council and Organization of the Islamic Conference(OIC). It participates in the North Atlantic Treaty Organization's (NATO) Partnership for Peace program. Kazakhstan is a member of the Commonwealth of Independent States, the Economic Cooperation Organization and the Shanghai Cooperation Organization. The nations of Kazakhstan, Belarus, Kyrgyzstan, and Tajikistan established the Eurasian Economic Community in 2000 to harmonize tariffs and create a free trade zone. Since independence, Kazakhstan has sought equally good relations with Russia, China, the United States, and the West. Companies from the U.S., Russia, China, and Europe are present at all fields. Kazakhstan's National Security Committee was established in 1992. It includes the Service of Internal Security, Military Counterintelligence, border guard, several commando units, and Foreign Intelligence (Barlau). Kazakhstan acquired from the Soviet Union all the units of the 40th (the former 32nd) Army and part of the 17th Army Corps, including six land force divisions, storage bases, the 14th and 35th air-landing brigades, two rocket brigades, two artillery regiments and a large amount of equipment which had been withdrawn from over the Urals after the signing of the Treaty on Conventional Armed Forces in Europe. The Kazakh Air Defence Force's fighter aircraft element consists of the 356th Fighter Aviation Regiment, flying MiG-31s from Semipalitinsk Airport. The Republican Guard had 2500 soldiers in 1994, and is not part of the army. Kazakhstan sent 29 military engineers to Iraq as part of the Coalition of the Willing to assist the U.S. occupation in Iraq. A meat vendor at the Green Market in Almaty, Kazakhastan. Kazakhstan, the largest of the former Soviet republics in territory, excluding Russia, possesses enormous fossil fuel reserves and plentiful supplies of other minerals and metals. It also has a large agricultural sector featuring livestock and grain. Kazakhstan's industrial sector rests on the extraction and processing of these natural resources and also on a growing machine-building sector specializing in construction equipment, tractors, agricultural machinery, and some defense items. The breakup of the USSR in December 1991 and the collapse in demand for Kazakhstan's traditional heavy industry products resulted in a short-term contraction of the economy, with the steepest annual decline occurring in 1994. In 1995-1997, the pace of the government program of economic reform and privatization quickened, resulting in a substantial shifting of assets into the private sector. Kazakhstan enjoyed double-digit growth in 2000-2001 – eight percent or more per year in 2002-2006 - due largely to its booming energy sector, but also to economic reform, good harvests, and foreign investment. The opening of the Caspian Consortium pipeline in 2001, from western Kazakhstan's Tengiz oilfield to the Black Sea, substantially raised export capacity. Kazakhstan in 2006 completed the Atasu-Alashankou portion of an oil pipeline to China that is planned to extend from the country's Caspian coast eastward to the Chinese border in future construction. The country has embarked upon an industrial policy designed to diversify the economy away from over-dependence on the oil sector by developing light industry. The policy aims to reduce the influence of foreign investment and foreign personnel. The government has engaged in several disputes with foreign oil companies over the terms of production agreements; tensions continue. Upward pressure on the local currency continued in 2006 due to massive oil-related foreign-exchange inflows. Aided by strong growth and low inflation, Kazakhstan aspires to become a regional financial center and has created a banking system comparable to those in Central Europe. 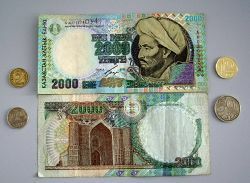 In 2000, Kazakhstan adopted a new tax code in an effort to consolidate gains. In November 2003 the new tax code was adopted, reducing value added tax from 16 percent to 15 percent, the social tax from 21 percent to 20 percent, and the personal income tax from 30 percent to 20 percent. Energy is the leading economic sector. Production of crude oil and natural gas condensate in Kazakhstan amounted to 51.2 million tons in 2003. Kazakhstan's 2003 oil exports were valued at more than $7-billion, representing 65 percent of overall exports and 24 percent of the GDP. Major oil and gas fields and their recoverable oil reserves are Tengiz with seven billion barrels; Karachaganak with eight billion barrels (and 1350km³ of natural gas); and Kashagan with seven to nine billion barrels. Agriculture accounted for 13.6 percent of Kazakhstan's GDP in 2003. Grain (Kazakhstan is the sixth-largest producer in the world) and livestock are the most important agricultural commodities. Agricultural land occupies more than 327,000 square miles (846,000 square kilometres). Chief livestock products are dairy products, leather, meat, and wool. The country's major crops include wheat, barley, cotton, and rice. Wheat exports, a major source of hard currency, rank among the leading commodities in Kazakhstan's export trade. In 2003 Kazakhstan harvested 17.6 million tons of grain in gross, 2.8 percent higher compared to 2002. Kazakh agriculture still has many environmental problems from mismanagement during its years in the Soviet Union. Exports totalled $35.55-billion in 2006. Export commodities included oil and oil products 58 percent, ferrous metals 24 percent, chemicals 5 percent, machinery 3 percent, grain, wool, meat, and coal. Export partners included Russia 12.4 percent, Germany 12 percent, China 11.2 percent, Italy 8.9 percent, France 8.6 percent, Romania 5.1 percent, U.S. 4.5 percent. Imports totaled $22-billion in 2006. Import commodities included machinery and equipment 41 percent, metal products 28 percent, foodstuffs 8 percent. Import partners included Russia 35.7 percent, China 21.3 percent, and Germany 7.1 percent. Per capita GDP was $8318 in 2005, and per capita rank was 70th on a list of 194 countries. 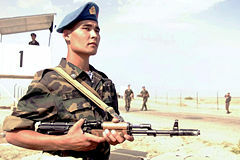 Kazakhstan has a diverse demography is due to the country's central location and its use by Russia as a place to send colonists, dissidents, and minority groups. From the 1930s until the 1950s, many minorities were interned in labor camps. This makes Kazakhstan one of the few places on earth where normally-disparate Germanic, Indo-Iranian, Chinese, Chechen, and Turkic groups live together in a rural setting and not as a result of modern immigration. The large migratory population of Kazakhstan, emigration, and the low population density - only about 5.5 persons per square kilometer in an area the size of Western Europe, make census figures difficult to measure. After the fall of the Soviet Union, the German population of Kazakhstan emigrated en masse as Germany was willing to repatriate them, as did much of the smaller Greek minority (to Greece), and Russians (to Russia). Other groups left because of the economic situation. This, plus a higher Kazakh birthrate, and ethnic Kazakh immigration from the People's Republic of China, gave the Kazakhs a majority along with Mongolia, and Russia. In the early twenty-first century, Kazakhstan became one of the leading nations in international adoptions. Ethnic Kazakhs make up 63 percent of the population, and ethnic Russians 24 percent. An amazingly rich array of other groups include Ukrainians, Uzbeks, Germans, Chechens, Koreans, and Uyghurs. There is also a small but active Jewish community. The Russian term “Kazakhstani” was coined to describe all inhabitants of Kazakhstan, including non-Kazakhs. The word "Kazakh" is generally used to refer to people of actual Kazakh descent (including those living in China, Afghanistan, and other Central Asian countries). Arabs brought Islam in the ninth century, and 1000 years later Russian settlers introduced Russian Orthodoxy. During the 70 years of Soviet rule, religious participation was banned, and many churches and mosques were destroyed. In 2007, the main religious groups were Muslim (mainly Sunni) 47 percent, Russian Orthodox 44 percent, Protestant 2 percent, and other 7 percent. Although Islam was introduced in the ninth century, the religion was not fully assimilated until much later. As a result, it coexisted with earlier animist elements of Tengriism, which is a traditional Kazak belief that held that separate spirits inhabited and animated the earth, sky, water, and fire, as well as domestic animals. Honored guests in rural settings are still treated to a feast of freshly killed lamb, and are sometimes asked to bless the lamb and to ask its spirit for permission to partake of its flesh. While formal religious observance is limited, many Kazakhs say a short prayer when they pass by where someone they know is buried, and say prayers after meals. Mosques are staffed by a mullah, who conducts services as well as funerals, weddings, and blessings, as do priests in Russian Orthodox churches. Kazakhstan is a bilingual country. The Kazakh language, a Turkic language, is spoken by 64.4 percent of the population, and has the status of the state language, while Russian is used routinely in business. Language is a contentious issue. While Russian has been widely used as the inter-ethnic means of communications, Kazakhstan has not been able to use its distinct national language to unite ethnic communities. Women occupy important roles in the workforce as school principals, bank presidents, teachers, accountants, police officers, secretaries, and government workers, and make up half of the workforce. This trend was expected to continue as girls out-perform boys at school, and alcoholism among men increases. Kazakh culture is traditionally patriarchal. In rural areas women prepare the food, and do interior household chores. 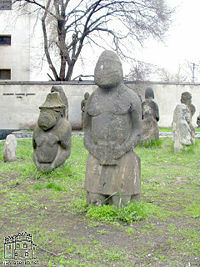 Kipchak steppe art, as exhibited in Dnepropetrovsk. Marriages usually result from dating and courtship. Interracial marriage is rare. No couple related over the past seven generations may marry, and the male should be older than the female. Families of the bride and groom meet before the wedding, and exchange gifts and dowries. Weddings are three-day events. Divorce is not uncommon; there are no rules for who gets what, but women usually keep the children. A nomadic tradition of wife stealing is still practiced, although rarely. A man may kidnap any unmarried girl 15 years of age and over. The girl spends a night alone with the man. The next day she is taken to meet her mother-in-law, who ties a scarf around the girl's head show she is married. Domestic units are rarely limited to a mother, father, and their children, since grandparents and extended family often live within one household. The youngest son may take a wife and have a family, but is expected to stay at home with his parents and care for them into their old age. Kazakhs regard it as important to know about their kin groups. Relatives from far away can be expected to help financially in times of crisis. At childbirth, some Kazakhs practice a custom of not letting anyone besides close family members see a newborn for the first 40 days. Then the family holds a small party and presents the baby to extended family and friends. Babies are well cared for. Education is universal and mandatory through to the secondary level. There are three main educational phases: Primary education (forms 1 to 4), basic general education (forms 5–9) and senior level education (forms 10–11 or 12) divided into continued general education and professional education. Primary education is preceded by one year of pre-school education. These three levels of education can be followed in one institution or in different ones (e.g. primary school, then secondary school). New entrants are assigned to classes of about 25 pupils in the first grade, and that class stays together until the 11th grade, with the same teacher until the fourth grade, and a different teacher through to the eleventh grade. The teachers are like second mothers or fathers, discipline is important, homework is extensive and grades difficult. Several secondary schools, specialized schools, magnet schools, gymnasium schools, lyceums, linguistic and technical gymnasiums, have been founded. Secondary professional education is offered in special professional or technical schools, lyceums or colleges and vocational schools. At tertiary level, there are universities, academies, and institutes, conservatories, higher schools and higher colleges. At this level, there are three main levels: basic higher education, that provides the fundamentals of the chosen field of study and leads to a bachelor degree; specialized higher education, after which students are awarded the specialist's diploma; and scientific-pedagogical higher education, which leads to the master's degree. Postgraduate education leads to the Kandidat Nauk (Candidate of Sciences) and the Doctor of Sciences. With the adoption of the Laws on Education and on Higher Education, a private sector has been established and several private institutions have been licensed. The adult literacy rate is 99.5 percent. In 2000, the Government of Kazakhstan joined the governments of the Kyrgyzstan and Tajikistan, and Aga Khan IV to establish the world’s first internationally chartered institution of higher education, the University of Central Asia, which was intended to have three campuses of equal size and stature in each of the founding countries. Houses built and subsidized by the former Soviet government were cheap and available to all, and most people retained their property from the Soviet years. Occupiers own most apartments, although investing in rental property is more widespread. The new rich, who often flaunt their wealth, are termed "New Kazakh" or "New Russian," and contrast with the vast number of unemployed or underpaid. Poverty and accusations of unfair treatment have raised tensions between Kazakhs and non-Kazakhs. While the rich drive expensive cars, wear fashionable clothes, and throw lavish parties, the poor drive old Soviet cars or take a bus, wear cheap Chinese- or Turkish-import clothes, and save for months to pay for a wedding. Riders in traditional dress demonstrate Kazakhstan's equestrian culture by playing a kissing game, Kuuz Kuu ("Catch the Girl"), one of a number of traditional games played on horseback. Before the Russian conquest, the Kazaks had a well-articulated culture based on their nomadic pastoral economy. Because animal husbandry was central to the Kazaks' traditional lifestyle, most of their nomadic practices and customs relate in some way to livestock. Traditional curses and blessings invoked disease or fecundity among animals, and good manners required that a person ask first about the health of a man's livestock when greeting him and only afterward inquire about the human aspects of his life. Lamb has a symbolic value in the culture. Kazakhs can be superstitious. Whistling inside a house is unacceptable since it is believed that it will make the owner of the house poor. Smoking by women is not accepted. Kazakhs often don't smile at people in public except to those they know, and rarely form lines when boarding crowded buses. Women and girls often hold hands as they walk; boys hook arms or walk with their arms around each other. Kissing cheeks and embracing is perfectly acceptable between good friends. Kazakh men shake hands with an acquaintance the first time they see each other in a day. All remove their shoes when inside a house—guests remove their shoes at the door and often put on a pair of slippers. 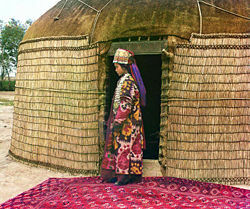 A Uzbek woman at the entrance to a yurt in 1913. Picture by Sergei Mikhailovich Prokudin-Gorskii. The traditional Kazak dwelling is the yurt, a tent consisting of a flexible framework of willow wood covered with varying thicknesses of felt. The open top permits smoke from the central hearth to escape. Temperature and draft can be controlled by a flap that increases or decreases the size of the opening. A properly constructed yurt can be cooled in summer and warmed in winter, and it can be disassembled or set up in less than an hour. The right side of the yurt's interior is reserved for men and the left for women. Although yurts are used less, they remain a potent symbol. Demonstrators and hunger strikers erected yurts in front of the government building in Almaty in the spring of 1992. Yurts are frequently used as a decorative motif in restaurants and other public buildings. Russian settlers in the eighteenth and nineteenth centuries brought small A-frame houses, Russian Orthodox churches, and wooden buildings. Buildings from the Soviet era were big and utilitarian, and often the same shape, size, and color throughout the Soviet empire. Large Soviet-designed apartment blocks were five or six stories high and had three to four apartments of one, two, or three bedrooms each per floor. Villages and collectives consisted of small two- to three-room, one-story houses, painted white and light blue (to keep away evil spirits), all built by the government. Large squares and parks were built in every town. Oil money, and foreign investment have brought five-star high-rise hotels, casinos, Turkish fast food restaurants, American steak houses, bowling alleys and movie theaters. Private homes are bigger, with two and three stories, two-car garages and large, fenced-in yards. 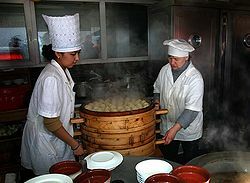 Kazakh food preparation began to develop in the thirteenth century. Daily meals are hearty, always including bread and usually noodles or potatoes and then a meat. One common dish is pilaf, a rice dish usually made with carrots, mutton, and a lot of oil. Russian borscht, usually red (beet-based) or brown (meat-based), with cabbage, meat, and potatoes, and a large dollop of sour cream, is popular. Russian pelimnin, dough pockets filled with meat and onions, is often a daily meal. A flat, round bread called leipioskka and seasonal fruits and vegetables are served with almost every meal. Kazakhstan is known for its apples. Shashlik, marinated meat roasted over a small flame and served on a stick, is sold at roadside cafés and corner shashlik stands. Tea is an integral part of life, and is drunk six or seven times a day. Guests are always offered tea. Muslim Kazakhs do not eat pork. Kazakhs have great respect for bread, which should never be wasted, thrown away, and should always be placed on the table right side up. Food is eaten with one's hands. On special occasions, beshbarmak, traditionally horse meat boiled on the bone, is served over noodles covered in a meat broth called souppa. The host gives out pieces of meat in an order of respect usually based on seniority or distance traveled. When beshbarmak is made of mutton, the head of the sheep will be boiled, intact, and served to the most honored guest. An intoxicating fermented horse's milk called kumis, believed to be therapeutic, is occasionally drunk at ceremonial occasions. Vodka, which permeates the culture, is consumed in large quantities at all ceremonies. Toasts always precede a drink of vodka. Kazakh music is nomadic and rural, and is closely related to Uzbek and Kyrgyz folk forms. Traveling bards, healers and mystics called akyn are popular, and usually sing either unaccompanied or with a string instrument, especially a dombra, a mandolin-like string instrument, or kobyz. Akyn performance contests are called aitys; their lyrics are often social or political, and are generally improvised, witty remarks. Traditional Kazakh music includes ensembles using instruments like the kobyz or dombra, as well as kyl-kobyz, sherter, sybyzgy, saszyrnay and shankobyz. The most common instrumental traditions are called kobizovaia, sibiz-govaia, and dombrovaia. Many songs are connected to ancient mythology and folk religious beliefs (kui), while others were composed after the rise of authored works (kuishi) by early songwriters (jiray) like Mahmud Kashgari, Kaztygana, Dospanbeta, Shalkiiza and Aktamberdi. The kuishi tradition is said to have peaked in the nineteenth century. In the twentieth century, the first star was the singer Mayra Shamsutdinova, a woman. The Kazakhs themselves, however, did not write their own music in notation until 1931. Later, as part of the Soviet Union, Kazakh folk culture was encouraged in a sanitized manner designed to avoid political and social unrest. The result was a bland derivative of real Kazakh folk music. In 1920, A. V. Zataevich, a Russian official who created works of art music with melodies and other elements of Kazakh folk music, adapted traditional Kazakh instruments for use in Russian-style ensembles, such as by increasing the number of frets and strings. Pop music in Kazakhstan has made a resurgence since the year 2000. Talent searches have always been an integral part of the Kazakh pop music industry, such as the project Anshi Balapan & Idol spinoff SuperStar KZ, a reality television show based on the popular British show Pop Idol. The show is a contest to determine the best young singer in Kazakhstan. Kazak literary tradition is rich in oral histories. These histories were memorized and recited by the akyn, the elder responsible for remembering the legends and histories, and by jyrau, lyric poets who traveled with the high-placed khans. Most of the legends concern the activities of a batir, or hero-warrior. Among the tales that have survived are Koblandy-batir (fifteenth or sixteenth century), Er Sain (sixteenth century), and Er Targyn (sixteenth century), all of which concern the struggle against the Kalmyks; Kozy Korpesh and Bain sulu, both epics; and the love lyric Kyz-Zhibek. Usually these tales were recited in a song-like chant, frequently to the accompaniment of drums and the dombra. For the most part, pre-independence cultural life in Kazakstan was indistinguishable from that elsewhere in the Soviet Union. That Russified cultural establishment nevertheless produced many of the most important figures of the early stages of Kazak nationalist self-assertion, including novelist Anuar Alimzhanov, who became president of the last Soviet Congress of People's Deputies, and poets Mukhtar Shakhanov and Olzhas Suleymenov, who were co-presidents of the political party Popular Congress of Kazakhstan. Suleymenov in 1975 became a pan-Central Asian hero by publishing a book, Az i Ia, examining the Lay of Igor's Campaign, a medieval tale vital to the Russian national culture, from the perspective of the Turkic Pechenegs whom Igor defeated. Soviet authorities subjected the book to a blistering attack. Later Suleymenov used his prestige to give authority to the Nevada-Semipalatinsk anti-nuclear movement, which helped end nuclear testing in Kazakhstan. Kazakhstan has achieved some success in international competitions in weightlifting, ice hockey, and boxing. Kazakhstan won eight medals in the 2004 Summer Olympics - the largest tally for any nation in Western Asia. Football (soccer) is popular, with the Kazakhstan Super League being the top-level competition for the sport in the country. Numerous professional cyclists competing on the European circuit come from Kazakhstan. Most notable is Alexander Vinokourov. Aliya Yussupova placed fourth in the 2004 Summer Olympic Games in Athens. She has been among medal winners in several previous tournaments. She was considered to be one of the top rhythmic gymnasts in the world. Kazakh boxers in the last three Olympic had more medals than any countries except Cuba and Russia. In 1996 and 2004 two Kazakh boxers, Vasiliy Jirov in 1996 and Bakhtiyar Artayev in 2004, were recognized as the best boxers for their techniques. Kazakhstani boxer Oleg Maskaev was the WBC Heavyweight Champion after knocking out Hasim Rahman on August 12, 2006. The Kazakhstani national ice hockey team has competed in the 1998 and 2006 Winter Olympics as well as in the 2006 Men's World Ice Hockey Championships. Public holidays include: January 1, New Year's Day; January 7, Russian Orthodox Christmas (not an official holiday, but usually taken as a vacation); March 8, International Women's Day; March 22, Nauryz Meyrami (a springtime holiday marking the beginning of a new year); May 1, Kazakhstan People’s May Day; May 9, World War II Victory Day; August 30, Constitution Day; October 25, Republic Day; December 16, Independence Day. ↑ 2.0 2.1 CIA, Kazakhstan World Factbook. Retrieved May 18, 2018. ↑ Johann Schneider, Knud S. Larsen, Krum Krumov, and Grigorii Vazow, Advances in International Psychology: Research Approaches and Personal Dispositions, Socialization Processes and Organizational Behavior (Kassel University Press, 2013, ISBN 978-3862194544). ↑ 4.0 4.1 4.2 4.3 Kazakhstan International Monetary Fund. Retrieved May 18, 2018. This page was last modified on 20 March 2019, at 22:39.